Disclaimers: This is not a troll. 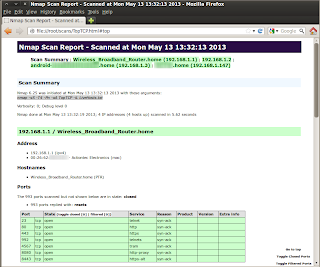 :) Scans were run as root (or sudo) using Nmap version 6.25. Few would dispute that the de facto standard scanning tool is Gordon Lyon’s (aka Fyodor) Nmap. However, if we asked you to thoroughly and efficiently scan a remote class C (192.168.1.1/24) network, which of the following would you run? The answer we hear most often is option a. While this may work for small networks, it does not scale for larger networks or more thorough assessments. The astute reader will notice that options a, b, and c, operate identically. Option a provides the network range in CIDR notation and since -sS is the default scan type when no options are supplied--option b is identical to option a. Examining option c, reveals that it is the same as options a and b, except that the target is supplied using a network range instead of CIDR notation. The problem with options a, b, and c is that they will not thoroughly scan the remote class c network as they will only scan the top 1000 TCP ports. Option d is close to what we are looking for since it scans all of the TCP ports; however, it lacks efficiency since we will be scanning all ports on all hosts, including dead IP space. The most important thing to keep in mind is that in this simple example, we are only asking to scan a class C network. However as security practitioners, we are often faced with multiple class C’s, class B’s or even in some cases, class A networks. We will take the rest of this article to outline a scan strategy for networks of all sizes and some tips and tricks for carving the output. 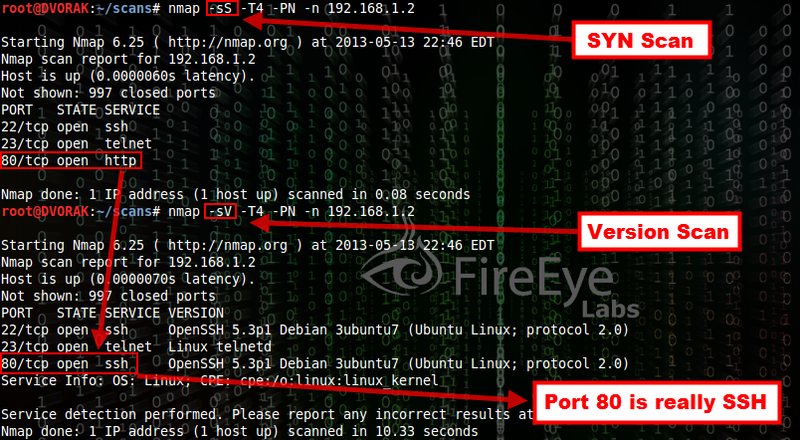 The option we will focus on in this article is the most popular and the default for host discovery (-sn “Ping Scan”). Figure 1: Packet capture confirms behavior of a remote "Ping Scan"
When scanning a local network, Nmap automatically switches to using ARP requests. This is desirable intelligence because fewer packets are sent and it is generally more accurate. A system that blocks all ICMP traffic and filters TCP ports 80 and 443 would be invisible to the four remote discovery packets sent above. However, hosts typically respond to ARP requests because layer 2 addresses are necessary to construct packet headers. Figure 2: Packet capture confirms behavior of a local "Ping Scan"
For the first packet capture, the scanning host was placed on a different subnet than that of the targets--this caused Nmap to use the 4 discovery packets shown in Figure 1. For the second packet capture, the scanning host was placed in the same broadcast range and thus ARP was utilized for discovery as shown in Figure 2. Both of the packet captures were created with the same discovery scan shown below. Aggressive (-T4) throttling is substantially faster than the default Normal (-T3) throttle. We have rarely (if ever) seen Aggressive scanning crash a host or flood a network. This should be what you start with unless you know of particular hosts that are sensitive to scanning. With that said, if hosts are known to crash on simple scans or become easily flooded, avoid scanning them with -T4 and possibly try Polite (-T2) throttling. Please realize that -T2 may be up to 10 times slower than -T3, so be patient and only run it on your most sensitive hosts--not hundreds at a time. More importantly, avoid any one-off scans such as version scanning as these are more likely to crash hosts than the speed of the scan. Some older SCADA components are known to fall over from simple port scanning, not to mention version scanning. In general, we do not recommend Insane mode (-T5) as this can negatively affect accuracy. Lastly, we only recommend -T0 or -T1 when trying to be extra stealthy (IDS evasion) and only for scanning a few ports on a few hosts because it will likely be too slow for anything else. The resulting LiveHosts.txt file is one IP address per line, which can be supplied as input to Nmap and other tools as well. Each host can have a maximum of 131,072 ports (that is 2^16 = 65536, then multiply by 2 for TCP and UDP). But why would anyone need to scan all of those ports? Why isn’t the top 1000 good enough--especially after we highlighted how effective it was? One surprising port that is not contained in the top 1000 is TCP/2433 (the alternative default MS-SQL port, which can be a misconfigured Achilles heel for many networks). Thus, skipping the full port scan can miss critical services that may be the entry point for an attacker or a piece of malware. Assuming that full port scans are desired, these can be executed when the most common port scans finish. Full port scans will take substantially longer to finish than the common port scans. Thus, it is ideal to have the results of the common port scans as something to review while the full port scans are running. Note: Full port UDP scanning is VERY slow, and for extremely large networks may never finish in a reasonable amount of time. So what does the scanning process look like when combined? Following this process should perform efficient host discovery, live host file generation, and full port scans for both TCP and UDP (along with the top 1000 ports, in case the full port scan does not finish in time). After reviewing the common port scans (or full port scans if available), a few hosts of concern may emerge. If this is the case, a more intensive scan may be desired such as a service and/or operating system scan. These more intensive scans should not be used in discovery on a large network because it may take too long to finish. 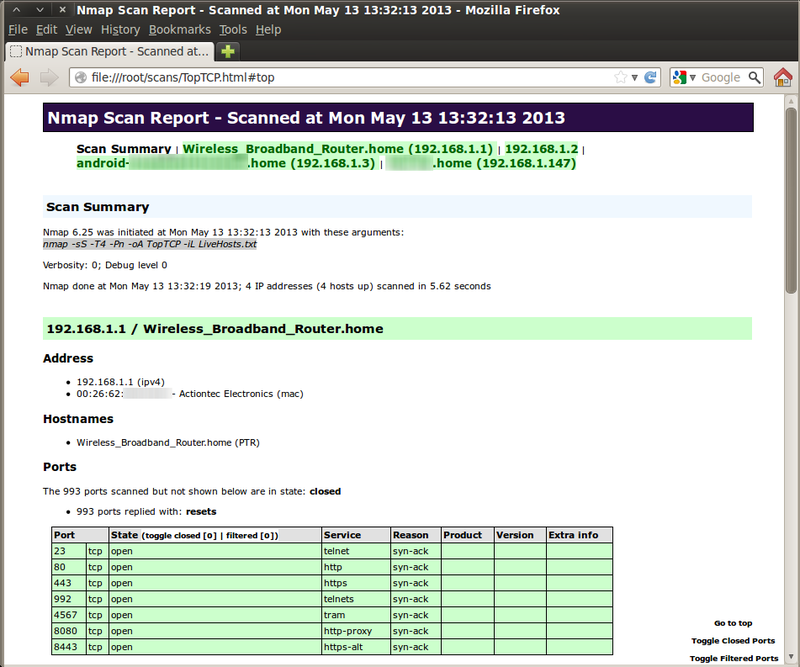 If you have many live hosts, only run these scans on select hosts where more information is desired. The ports that were discovered in prior scans were quickly labeled with associated services based on the nmap-services database of about 2,200 well-known services. The example scan below shows ports 22, 23, and 80 all labeled with the expected services ssh, telnet, and http respectively. However, since applications/services can run on any arbitrary port, additional probing may be desired to ensure that the service matches the associated port. For this additional probing, version detection (-sV) is useful. Notice that while the SYN scan (-sS) labeled port 80/tcp as http (per the nmap-services information), a deeper version scan (-sV) revealed that port 80 was really another instance of SSH. Figure 3: The screenshot above shows a SYN scan and a Version scan. The version scan revealed that port 80 is actually SSH. The version scan also correctly guessed the version of SSH. As you can see, version scanning is quite useful, but as mentioned earlier, it comes at a cost. It requires more packets and thus takes longer to scan. Notice in figure 3 that the SYN scan finished in 0.08 seconds, while it took the version scan 10.33 seconds. Multiply the difference by thousands of machines and it adds up. 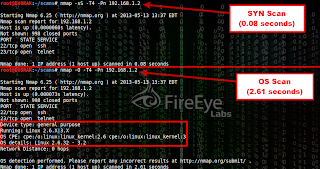 However, if you need more detail, such as the specific version of Windows or Linux, this is where Nmap’s operating system scan comes in handy. Nmap uses TCP/IP stack fingerprinting and an nmap-os-db of more than 2,600 known OS fingerprints in order to accurately identify the operating system. In most cases it is in the ballpark and if it does list a few operating systems, the correct OS is usually in the list. Caution: Add the necessary ports using the -p option if the ports you want to use for operating system scans are not in the top 1000 ports. Also be sure to include at least one open and one closed port to achieve a more accurate operating system guess. Figure 4: Comparison between SYN scan and operating system scan. Some may want to use both -sV and -O at the same time, which is fine. There is even a shortcut option for this discussed in the next section; however, we will provide a word of warning there as well. 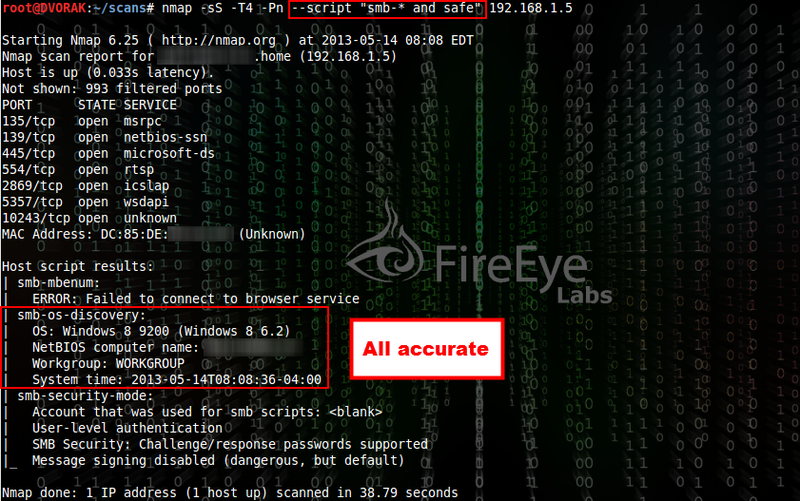 Prior to the Nmap Scripting Engine (NSE), Nmap had very limited vulnerability scanning capabilities. However, with the addition of NSE scripts, it can now seek out (and in some cases exploit) vulnerabilities. This increases the flexibility and extensibility of Nmap by allowing users to write their own scripts with just a little bit of LUA scripting knowledge. At the time of this writing, there are 433 NSE scripts provided as part of the Nmap download. To view the scripts that are available, list the directories that contain the NSE scripts. Since these are interpreted (and not compiled) scripts, it is possible to view the source to better understand what they do and even tweak them to behave differently. It is also quite helpful to start from one of these functioning scripts if LUA is not your forte. Since NSE was designed for a variety purposes, including extended version scanning, vulnerability detection and even exploitation, all scripts have one or more categories defined. This not only adds organization, but it can simplify the choices when running multiple scripts by being able to select a family of scripts based on their categories. Category options are: auth, broadcast, brute, default, discovery, dos, exploit, external, fuzzer, intrusive, malware, safe, version, and vuln. -A = Aggressive scanning: Performs the following: Operating System (-O), Version (-sV), Script scanning (-sC) and traceroute (--traceroute). The reason why caution should be applied when running either of these options is that default scripts can include scripts in the intrusive category, which have the potential to crash systems or make printers go crazy. As mentioned earlier, the output options for Nmap are normal (.nmap), greppable (.gnmap), and XML (.xml). We will now explore how we can manipulate these standard output formats to achieve even greater insight--which is particularly useful when viewing larger output files. We just illustrated the usefulness of normal and greppable output files, however XML files are also useful. 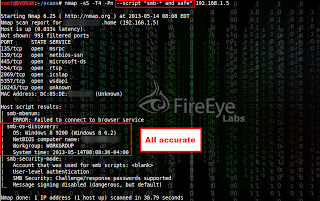 Nmap XML files can be converted into HTML format for easy viewing within a web browser. This is possible through using Extensible Stylesheet Language Transformations (XSLT). One very reliable method is using the xsltproc tool (from http://xmlsoft.org/XSLT/). Using it is simple and the result is portable. Use the Nmap XML file for input and use -o to specify the output file. Notice that the output is very organized and port information is even displayed in easy to read tables. Navigation is made convenient through the use of the included hyperlinks and search functionality provided by the browser. 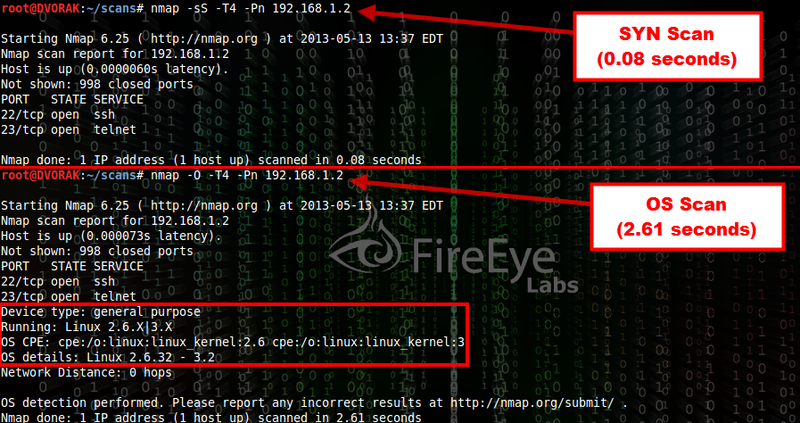 With little-to-no training, anyone can scan a network using Nmap by simply specifying the host or target range. While Fyodor has done a great job making Nmap default options as efficient as possible, you should still be able to improve scanning efficiency by customizing your scans. Hopefully, by sharing a proven scan methodology and tricks for manipulating the output, we have provided ideas for you to refine your Nmap scan strategy and get the most from your efforts.